Published by almostaghost on February 19, 2012 in 2012 review and almostaghost. 0 Comments Tags: Bad Religion, Band Of Skulls, Bob Dylan, Bryan Ferry, Cage The Elephant, Carly Simon, Collective Soul, Crowded House, Darren Criss, Ed Roland, Fistful Of Mercy, Floggin Molly, Freelance Whales, Joe Perry, K'naan, Ke$ha, Kronos Quartet, My Chemical Romance, Neil Finn, Nils Lofgren, Pajama Club, Paul Rodgers, RedOne, Sinead O'Connor, Ximena Sarinana, Zee Avi. Back for more! This disc looks even odder than disc two did, at first glance. A reminder: you can listen to the whole collection for free here (or purchase it if so inclined). 1. K’naan “With God On Our Side”: A few years ago, K’naan released a cool trilogy remix project, where he remixed the music of Bob Marley, Fela Kuti, and Bob Dylan. So he clearly knows Dylan, and it is great to get some rap/hiphop on this collection. K’naan impressively and effortlessly switches between his own rapped verses and singing Dylan’s verses of “With God On Our Side.” This might be the best track of all 3 discs yet. Dylan is an underappreciated influence on rap, and when a slow folk song like “With God On Our Side” fits so perfectly, that says a lot. 2. Ximena Sariñana “I Want You”: Ximena is a young Mexican singer (and soap actress). She gives “I Want You” a slight electro pop pulse. Fine. 3. Neil Finn with Pajama Club “She Belongs To Me”: You probably know Neil Finn from Crowded House, and this is his new band. I am surprised by the intensity of this, I was expecting something more laidback. 5. Zee Avi “Tomorrow Is A Long Time”: This song sets an impossibly high bar, as it is one of my very favorites, and because this cover exists. I was not aware of Zee Avi, but I gather that she got famous on YouTube and is a Malaysian ukulele player. Her voice is solid, but I’m finding that riff she’s playing to be grating. 6. Carly Simon “Just Like A Woman”: well done, I guess. 7. Flogging Molly “The Times, They Are A-Changin'”: Celtic punk rock. “The Times, They Are A-Changin'” The first verse is done like an Irish jig, and I wish the whole song were like that, instead of the loud punk section that hammers any subtlety of the song right out. 8. Fistful Of Mercy “Buckets Of Rain”: Fistful Of Mercy is George Harrison’s son Dhani’s band. Slide guitarist Ben Harper is also in it (and does a great job here). I don’t like group vocals for this song, which is Fistful Of Mercy’s thing, and it is also way too foot-tapping upbeat. I guess I complained earlier when other Blood On The Tracks covers are done too one-dimensionally sad; this one does not have that problem. 9. Joe Perry “Man Of Peace”: Why am I listening to a Joe Perry solo song? What am I doing here? Why is this happening? Why do I exist? Would it be better or worse if this was Aerosmith? 10. Bad Religion “It’s All Over Now, Baby Blue”: The hot guitar section of this disc continues with some more soaring punk. By far the best of the run here, which started with Flogging Molly. This song is amazingly versatile, and can probably be performed in every style ever and be cool. 11. My Chemical Romance “Desolation Row (live): Who in their right mind cuts a version of “Desolation Row” and makes it only 3 minutes long? My Chemical Romance is clearly not in their right mind. This is trying my patience. 12. RedOne and Nabil Khayat “Knockin’ On Heaven’s Door”: RedOne is Lady Gaga’s producer! This, however, is not a pop techno track, it’s a fairly faithful and upbeat version of the song, with acoustic guitars, piano, slide guitars. I can’t help but wish Lady Gaga were singing this though, just to make it even more interesting. Still, not a bad track. 13. Paul Rodgers & Nils Lofgren “Abandoned Love”: We had back into inane classic rock land and find Paul Rodgers doing his best to ruin one of the best and most intense songs Bob Dylan ever wrote. Please read about the song here. The live version written about there circulates, and it’s pretty phenomenal. 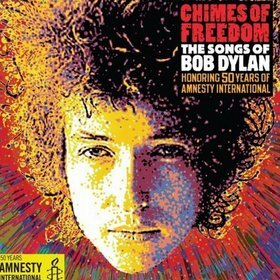 Dylan never could get a studio version to work right, but fans have that live version: here it is. 14. Darren Criss & Chuck Criss “New Morning”: Um. Darren Criss is on Glee. Chuck Criss is in the band Freelance Whales, who aren’t so bad, though. I assume they are related. Glee! This disc is really freaking strange. The Crisses seem to be having a good time though. 15. Cage The Elephant “The Lonesome Death Of Hattie Carroll”: Never been a big fan of Cage The Elephant, but I like the singer’s vocals here, and the bluesy electronic mix. Not bad. 16. Band Of Skulls “It Ain’t Me, Babe”: I had been remembering Band Of Skulls being somewhat hard rocking, but either my memory fails me, or they tamed WAAAAY down to do this song. They try to blues it up, but mostly just feels dreary to me. 17. Sinead O’Connor “Property Of Jesus”: I’ve always kind of liked O’Connor, and I like this, mostly. I wish her vocals were clearer here, though in a way it does give the song a sense of urgency. 18. Ed Roland and The Sweet Tea Project “Shelter From The Storm”: I, I don’t even. Roland is the main songwriter from Collective Soul. Who invited him? Is that better than Aerosmith’s guitarist or worse? 19. Ke$ha “Don’t Think Twice, It’s All Right”: This one got some press when the collection was released. Kesha sings the song, mostly acapella, before some strings join in, noteworthy because she actually breaks into tears while singing the song. And instead of fixing it, she left the moment in the song. Reactions were varied. It’s not an easy listen, that’s for sure, and I guess it depends on if you think it’s real or an act. Or your tolerance for that sort of raw emotion. I can’t imagine listening to this over and over, but I do kind of like it.